A passenger walks past a poster of Pope Francis at the Tocumen International Airport ahead of Pope Francis' visit for World Youth Day, in Panama City, Panama, Jan. 21, 2019. Vatican officials said the focus of the pope’s 26th foreign trip will be regional problems, migration, the fight against corruption and violence, and the role of women. In Panama, there are high hopes and much excitement on the part of young people and thousands of officials and volunteers involved in the preparations. 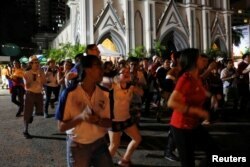 Panama’s President Juan Carlos Varela addressed the nation ahead of the papal visit. He said that “In the coming days we will be witnesses of one of the most important global events that will be celebrated in our beautiful country, World Youth Day and the visit of Pope Francis.” He added that it will be a week during which thousands of pilgrims will visit from the five continents and more than 150 countries. He said it will be “an opportunity to show the world the beauty of our land, the joy and nobility of the heart of our people”. A group of young people dance to music, ahead of Pope Francis' visit, in Panama City, Panama, Jan 21, 2019. Archbishop Jose Domingo Ulloa of Panama said Pope Francis' meeting with young detainees will be “a very special event” in which “young people deprived of freedom will take part in a penitential liturgy with the Holy Father”.